The Global Volcanism Program has no activity reports for Katmai. The Global Volcanism Program has no Weekly Reports available for Katmai. The Global Volcanism Program has no Bulletin Reports available for Katmai. Prior to 1912, Mount Katmai was a compound stratovolcano with four NE-SW-trending summits, most of which were truncated by caldera collapse in that year. 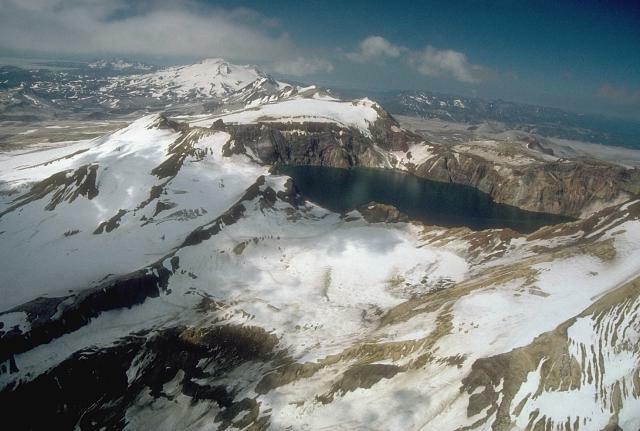 Two or more large explosive eruptions took place from Mount Katmai during the late Pleistocene. Most of the two overlapping pre-1912 Katmai volcanoes are Pleistocene in age, but Holocene lava flows from a flank vent descend the SE flank of the SW stratovolcano into the Katmai River canyon. Katmai was initially considered to be the source of the Valley of Ten Thousand Smokes ash flow in 1912. However, the 3 x 4 km wide caldera of 1912 is now known to have formed as a result of the voluminous eruption at nearby Novarupta volcano. 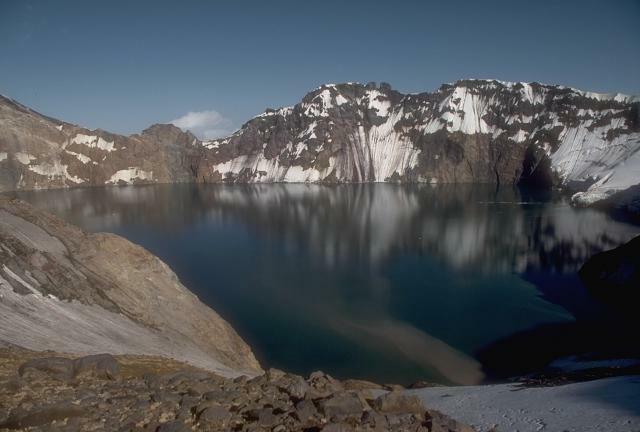 The steep walled young caldera has a jagged rim that rises 500-1000 m above the caldera floor and contains a 250-m-deep, still-rising lake. Lake waters have covered a small post-collapse lava dome (Horseshoe Island) that was seen on the caldera floor at the time of the initial ascent to the caldera rim in 1916. Post-1912 glaciers have formed on a bench within Katmai caldera. Curtis G H, 1968. The stratigraphy of the ejecta from the 1912 eruption of Mount Katmai and Novarupta, Alaska. Geol Soc Amer Mem, 116: 153-210. Fenner C N, 1930. Mount Katmai and Mount Mageik. Zeit Vulk, 13: 1-24. There is no Deformation History data available for Katmai. There is no Emissions History data available for Katmai. Katmai caldera, a collapse feature formed during the catastrophic eruption of the nearby Novarupta vent in June 1912 is seen here in an aerial view from the NE. The steep-walled, 1.5-km-wide Katmai caldera truncates a formerly 2290-m-high cluster of overlapping stratovolcanoes. The caldera is partially filled by a blue-green lake that is about 250 m deep and rising. Beyond the caldera are the multiple peaks of Trident volcano; Mageik volcano is the snow-and-ice-covered cone on the skyline. Photo by Chris Nye, 1991 (Alaska Division of Geological and Geophysical Surveys, Alaska Volcano Observatory). Katmai caldera, seen here from its west rim, is a 3 x 4.5 km wide caldera that formed in 1912. Little if any eruptive activity took place at Katmai itself, which prior to collapse was a complex of 4 small overlapping stratovolcanoes. Hydraulic draining of magma away from Katmai to Novarupta volcano (10 km to the west) during the catastrophic 1912 eruption caused the collapse of the unsupported summit(s) of Katmai. The 250-m-deep caldera lake covers a small lava dome and tuff ring that were erupted on the floor of the caldera. The following 76 samples associated with this volcano can be found in the Smithsonian's NMNH Department of Mineral Sciences collections, and may be availble for research (contact the Rock and Ore Collections Manager). Catalog number links will open a window with more information. Large Eruptions of Katmai Information about large Quaternary eruptions (VEI >= 4) is cataloged in the Large Magnitude Explosive Volcanic Eruptions (LaMEVE) database of the Volcano Global Risk Identification and Analysis Project (VOGRIPA).